If you’d like to work with a little more freedom through your daily computing tasks i.e. with one less wire connected to your computer, a wireless keyboard and mouse are possibly great options for you to explore. Seenda, operating since 2008, is a Shenzhen-based manufacturer of a wide range of computer accessories and consumer electronics that are designed to make your life a lot easier. The company does things a bit differently in terms of competitive pricing by offering products without involving any third parties, resulting in cost-efficient pricing for consumers. The company boasts a massive portfolio of superior-quality products including USB chargers and wireless computer peripherals such as the Seenda 2.4G Rechargeable Wireless Keyboard and Mouse. The Seenda 2.4G Rechargeable Wireless Keyboard and Mouse is in a league of its own owing to its rich set of features, sleek design and unmatched performance across a spectrum of computing tasks. Available in a choice of three appealing colors – black, space grey and white, both the mouse and keyboard included in this combo feature plug-and-play technology, so there’s no complicated setups to deal with. Unlike most other wireless peripherals in its segment that use, the lithium battery of the mouse and keyboard by Seenda can be recharged with the included micro USB cable, and once fully recharged offer up to an impressive up to 3 months of runtime. Tipping the scales at a modest at just 11 ounces and measuring a compact 11.1 x 5.3 x 0.6 inches, the keyboard in this set showcases a space-saving design, and even comes with a silicone cover to keep it clean and dust free. The mouse features 1200 DPI for accurate sensitivity, smooth tracking, and effortless scrolling. Additionally, the Seenda wireless mouse offers quite operation, and is appointed with a mute button to prevent disturbing others around you whether at home or office. The Seenda wireless mouse and keyboard combos is an ideal choice for those who want lightweight computer peripherals that do not do anything more than whisper. Both the mouse and keyboard in this combo are compatible with several versions of Windows OS including Windows 2000 and the latest Windows 10. Given their sleek design, the wireless devices included in this set can be used at home or at your workplace, and can be tucked away easily in your bag to haul around on the go. Furthermore, they can even be recharged easily when out and about by simply connected them with a power bank or USB power delivery devices, including your laptop. When it comes to comfort, the Seenda wireless mouse and keyboard take the gold owing to their ultra-sleek profile, and the fact that the keyboard is 1/3 smaller and thinner than a traditional keyboard. Both devices provide an interruption free performance thanks to 2.4 GHz wireless connectivity. Given that most PC’s and laptops are available in an array of shades, having 3 color options – black, space grey and white – makes it easier to get one that’s right for your workspace. When the 280 mA lithium battery is fully charged with the included micro USB, the keyboard and mouse included in this combo can run for 200+ hours before the next charge. Given that the keyboard weighs just 11 ounces and measures 11.1 x 5.3 x 0.6 inches, it is easy to carry with you in a bag on your daily commute. Both the Seenda wireless mouse and keyboard are compatible with old and new versions of Windows OS including Windows 2000 and the latest Windows 10. The devices showcase a sleek look owing mostly to their robust metal material construction. Further, it features a matte finish in the rear for a more stylish finish. This wireless frequency offers coverage over farther distances, allowing to work with little or no interference a longer distance away from your PC. The keyboard is equipped with low-profile keys that render a smooth and comfortable typing experience. The mouse features 1200 DPI resulting in accurate and smooth scrolling. The ultra-compact keyboard comes with a silicone cover to prevent dust accumulation. This features puts the devices in sleep mode after a period of inactivity in an effort to save battery power. The Seenda wireless mouse and keyboard come with several high-end features, some of which that are only seen in much higher priced models in its space. Even though the keyboard included in this combo does feature a caps lock indicator, it does not come with an onboard number pad. In addition, both devices offer a seamless user experience when used with Windows operating systems, but aren’t compatible with Mac OS. For a wireless mouse and keyboard combo that comes with an integrated number pad and offer some level of compatibility with Mac OS, the TopMate Wireless Keyboard and Mouse Combo is worth a second look. It comes in a few different colors including white and silver black, and offers interruption-free 2.4ghz connectivity. The keyboard features an ultra-slim profile and is equipped with suspended chocolate buttons for an enhanced typing experience, whereas the mouse can be adjusted between 1000 and 1600 DPI to suit individual preferences. For a wireless mouse and keyboard set that offers a top-notch performance and comes with an extensive list of award-worthy features, you really can’t go wrong with the Seenda rechargeable wireless mouse and keyboard combo. Both devices are easy to carry around owing to their lightweight and compact footprint, and feature an auto-sleep function that puts the devices in sleep mode after a short period of inactivity. They are compatible with several versions of Windows including Windows 2000, Windows XP and the latest Windows 10, and are easy to set up and use by simply plugging in the included USB dongle into one of the available USB ports on your PC. 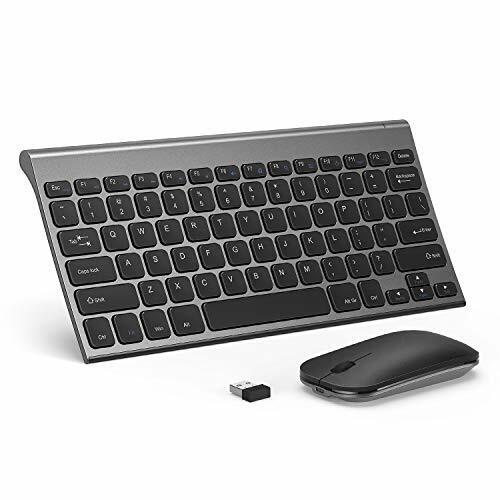 The keyboard included in this set features an ultra-slim profile and both devices connect via the latest 2.4 GHz signal, and are built with high quality material, so you can rest assured both wireless peripherals will serve you well for several years with proper care.